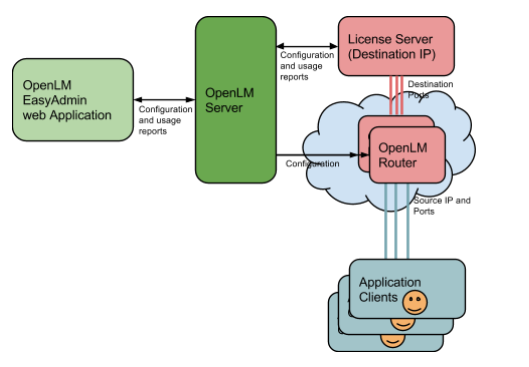 The OpenLM Router was initially designed to redirect license requests made by application users to their respective license servers. The Router’s method of employment is to intervene in the license request made by the application, en-route the license manager. The OpenLM Router requires OpenLM Server version 3.1. It is implemented as a Java application. Java 7 or higher is required. The Router should reside on a stable machine in the organization’s network. The OpenLM Router receives a transaction containing a source IP and port number. It propagates it to a specified target, bearing the destination IP and port numbers. The OpenLM Router may apply various restrictions to the propagation of license requests made by clients to the license managers. The OpenLM Router is not a part of the basic OpenLM package. As such it requires additional licensing. In order to verify that your OpenLM Server supports this capability, please open the license file (normally located at: C:\Program Files (x86)\OpenLM\OpenLM Server\License) and make sure it contains the “FEATURE name=Router” entry. 1. Download the latest version of the OpenLM Router from the OpenLM website. 2. Click the .EXE file to launch the installation wizard. 3. During the installation process, you will be prompted to set up the hostname and API port number of your OpenLM Server (e.g. localhost and 7022 respectively). 3b. It is also possible to switch to secured (SSL) communication between the OpenLM Server and Router. Please find a detailed explanation on this further below. 4. Follow the installation wizard to its completion. 5. 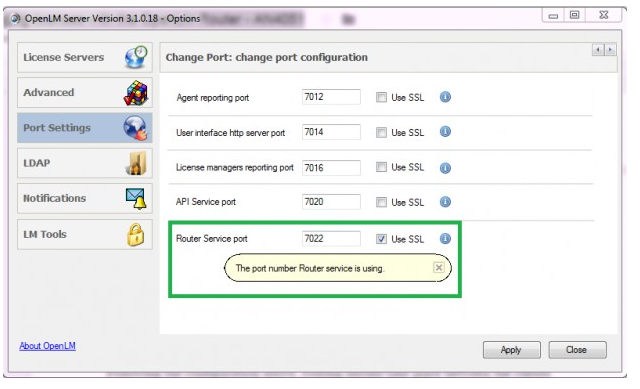 Open the ‘Services’ window, select the OpenLM Router service and start it manually. Open the OpenLM EasyAdmin web interface by typing “http://My_OpenLM_Server_Name:7019/EasyAdmin2/index.html” on your browser. Click ‘Start’ → ‘Administration’ → “Router Management”. The Router Management window opens. “Router groups” represent groups of routers that are configured identically, in order to support routing redundancy schemes. This is in accord with the requirement to keep this critical application active, and provide license requirement transactions active at all times. In order to configure a router group, open the “Router Management ” window (see above). Under the Router Groups tab, click the ‘Add’ icon. Provide a Router group name (e.g. group1) and click save. Under the Router Groups tab select the group of interest (e.g. group1). Select the ‘Routers’ tab on the bottom half of the “Router Management ” window. Note: When a router is initially configured to interface a specific OpenLM Server, the Router’s IP will be presented in that OpenLM Server’s EasyAdmin start → Widgets → Alerts window. Description: An optional short verbal description. Statistics interval (default 300 sec) – The rate at which the Router accumulates transfer routing statistics. Client IP Range: The IP range to which a client addresses a license request. The OpenLM Router should route this IP to the Target IP. Listener port: The client port to which a client addresses a license request. The OpenLM Router should redirect this request to the Target port. Listener Protocol (TCP / UDP. Default: TCP): Different license managers use different communication protocols, e.g. FlexLM uses TCP, Sentinel RMS uses UDP. Target host: the hostname or IP and the port to which license requests would be routed. 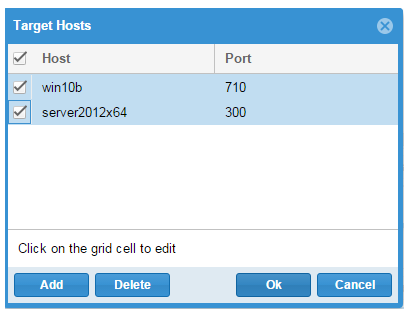 It is possible to configure more than one host+port configuration, thus implementing a multi-server redundancy environment. See more about that below. Application name: This is a descriptive free text field. User / Group: This is also a descriptive free text field. Allow (Allow/Block. Default: Allow). Allow or block the routing as described in the routing rule. Note that ‘Block’ has a higher priority. If a license request matches two instructions, one of which dictating ‘Block’, the request will not be routed. Period Limit:a time frame for which the rule will be applied. Clicking the textbox will open a form for introducing this information. 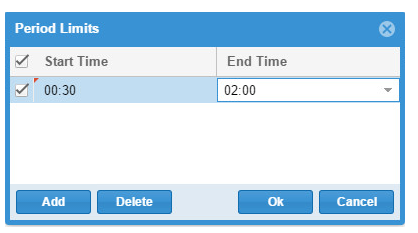 For example, in the image below the rule is applied between 00:30 and 02:00. According to this example, clients’ license requests will be first directed to server win10b, port 710. If the OpenLM Router detects no indication activity from that socket, it will direct license requests to the next listed server; server2012x64 port 300. Please note that multiple server redundancy will only be available for license server types that base their communication on the TCP/IP protocol (e.g. Flexnet). Multiple server redundancy for UDP based License servers (e.g. Sentinel RMS) is currently not supported. Make sure IIS is installed on the OpenLM Server machine. You can do that by attempting to browse to the localhost URL (http://localhost/). If it is not installed, you may follow the instructions on this post to install it. Install a valid Certificate in IIS or the OpenLM Server’s Local Computer trust store. The OpenLM Router will not work with self-signed certificates. 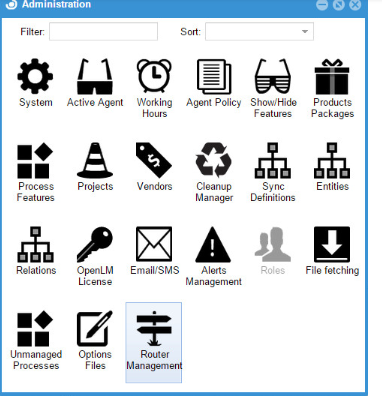 Open the Internet Information Services (IIS) Manager. Select “Default Web Site” and click “Bindings…” on the “Actions pane”. Add a new binding for the router port. The binding type should be HTTPS, and the default port number for OpenLM Router connection is 7022. Select the valid certificate that was installed above. Now you need to configure the OpenLM Router to communicate over secure connection. Double click the OpenLMRouterService.exe icon. The “OpenLM Router properties” window opens. Select the Startup tab. 5b. It is possible to specify the IP of a preferred network adapter on the OpenLM Router machine. See example 192.168.0.100 below. The Router will consequently only serve clients addressing the specified network adapter. ‘localhost’ and other IP addresses of the same server will NOT be served. 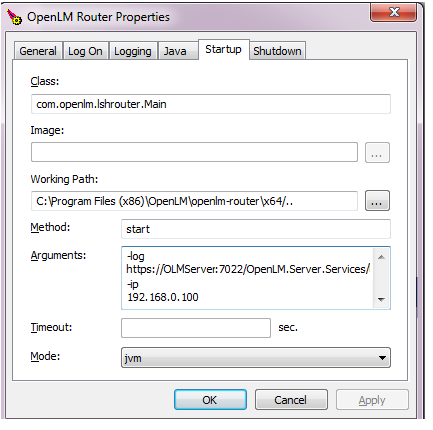 Stop and start the OpenLM Router service to apply the new URL. 3. Click the “Uninstall Service.bat” icon. The OpenLM Router service will disappear from the Services list. 4. Delete the OpenLM Router directory. 5. 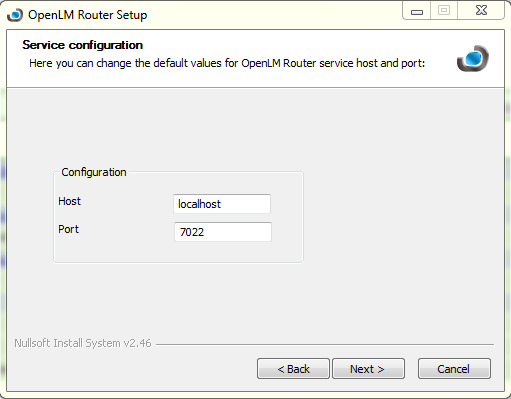 Install the new version of the OpenLM Router as described in this document. Following the configuration above, routing should take place between the clients requesting licenses, and the License server granting those licenses. The OpenLM Router logs this activity in a log file. This log is located by default in the ‘openlm-router’ installation directory. This is the ‘lsh-router.log’ file. If you have any further questions regarding the OpenLM Router, its configuration and performance – please feel free to address the OpenLM Support team (support@openlm.com), zip and attach the log folder and we’ll be glad to assist.